Sports of The Times: 76ers Finally Have a Victory. But Do They Really Have a Plan? Home /Sports of The Times: 76ers Finally Have a Victory. But Do They Really Have a Plan? 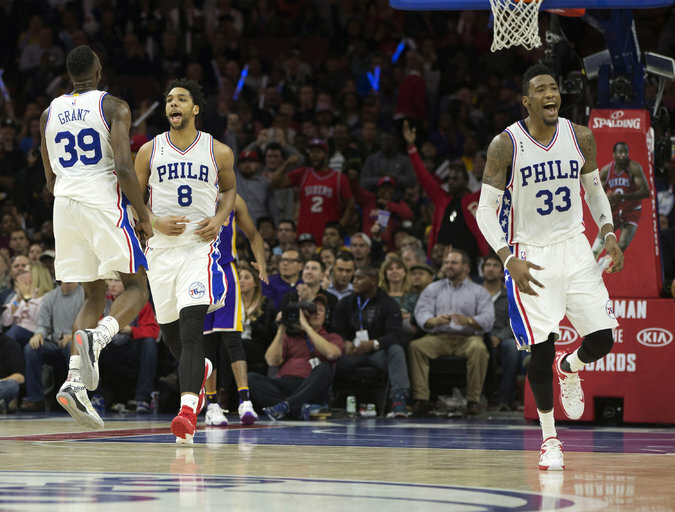 The Sixers’ Jahlil Okafor, center, Jerami Grant and Robert Covington finally had something to celebrate this season en route to a victory over the Lakers. The 76ers were playing poorly enough to extend their legendary 18-game losing streak and so set the N.B.A. record for ineptitude to start a season. But the Los Angeles Lakers, with their clueless play, matched the Sixers for execrable play. It was as if Kobe Bryant, with his autumn of the patriarch insistence on shooting and shooting and missing and missing, were willing the 76ers to victory. Bryant finished 7 for 26 on shot attempts. The 76ers won for the first time this season, 103-91.